Some 90% of consumers use the internet as their primary home shopping resource today. 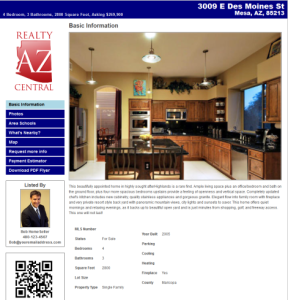 Realty AZ Central knows how critical it has become to market your home effectively online. Through one of our partners we have negotiated FREE single property websites for all! Within 48 hours we will provide you a dedicated website, optimized for major search engines, and syndicate it to other websites such as Zillow, Trulia, Oodle and others. The result is an effective, organic online approach to getting your home sold for top dollar, all for free with no cost or obligation. Your free property-website will have all the great features listed below. It’s easy to get started…Sign Up Here! Virtual Tour: The virtual tour is automatically created for you based on the images you provide and is featured right on the main page of the site. Image Gallery: Full image gallery to showcase various rooms, the outside of the home, and amenities. Easy Site Creation: All you need to provide is a description of the property, the property attributes (square footage, bed/bath, etc) and some pictures. Area Map: Map of the area around the home. What’s Nearby: Map of local restaurants, gyms, churches, etc. Lead Capturing Form: Form to request a showing of the property, results go to you . Printable PDF Flyer: Dynamically generated PDF flyers to use for marketing and leaving in the sign rider. Mobile Version: Each new listing site dynamically generates a gorgeous smartphone mobile version of the listing. QR Codes: QR codes are listed on the site and on the PDF flyer so that people can easily access the mobile version of the site on their smartphone. Listing Syndication: Each new listing can be automatically syndicated to HotPads, Oodle, FrontDoor, Trulia, etc. Listing Promotion: You will also receive a quick and easy 3 step guide to help you get your property in front of several hundred people instantly.